Washington, DC real estate buyers desiring upscale condominium living combined with hotel amenities, look no further—the Ritz-Carlton West End checks off all the boxes. 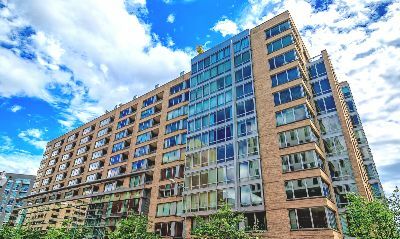 Located in the fashionable West End neighborhood, condos are in two buildings—North and South at 1111 and 1155 23rd Street NW. The hotel portion is at 1150 23rd Street, serving as a connector between the two other sections. The entire development has something of a U-shape with interior courtyard as well as ground-level retail components. There are 162 condo residences in this 11-story complex, available in a wide variety of floorplans. That means one, two, three, four and even five-bedroom homes, with flats, duplexes and penthouses. Sizes run all the way from 772 to 5,600 square feet, with recent listings ranging from $655,000 to $6,050,000. That latter number is not a typo! When you’re paying the big bucks, you expect a lot. Luxury condos for sale at the Ritz-Carlton West End feature bright and open layouts with hardwood floors, floor-to-ceiling windows, private outdoor spaces, spa baths and gourmet kitchens with granite counters, oversized cabinets and stainless steel appliances. But it doesn’t end there. Residents at the pet-friendly Ritz-Carlton also enjoy amenities such as 24/7 staffed front desk, concierge service, doorman, security, lounges, a cascading waterfall in the huge outdoor courtyard and a heated indoor pool and state-of-the art fitness center at the Sports Center, housed within the complex. Want more? How about room service, housekeeping, valet parkings, private chefs, a CVS Pharmacy, Sun Trust Bank, Greenworks and the popular Ris Bistro restaurant. And if for some reason you like the overall concept but can’t find the perfect condo of your dreams, you could always check for available listings at the Residences at Ritz-Carlton in Georgetown. The West End is a historic neighborhood that has evolved considerably in recent years. That includes lots of other posh condominiums such as 2501 M and 22 West. Surrounding communities include Dupont Circle, Georgetown and Foggy Bottom. There’s everything you need nearby, including shops, restaurants, entertainment, groceries at Trader Joe’s or Whole Foods and transit at the Foggy Bottom-GWU metro station. For more information, call District Partners Real Estate, LLC, a6 202-798-3600.